Nate Wissink doesn’t live in California. He doesn’t have coastal proximity. He doesn’t have eternal seasonal bliss. Technically he doesn’t even have the free time to talk to me (but he happily makes some anyway—thanks, Nate!). Nate Wissink does, however, have the passion and skill set to create a Minnesota home that beautifully reflects each of those inviting elements. Nate and his family’s new dream home, located in the Twin Cities. The Wissink’s architect, Andrea Swan of Swan Architecture, initially connected them with the property. “I would say this house is in the spirit of [Joseph] Eichler and resembles his homes,” says Nate. “Though he never did two-story work,” he adds, much to every fact-checker’s delight. The architecture of Nate’s home maximizes the use of glass and windows to promote a sort of pseudo-perennial outdoor living. “Since we can’t live outside year-round, we wanted to still feel connected to the outdoors. 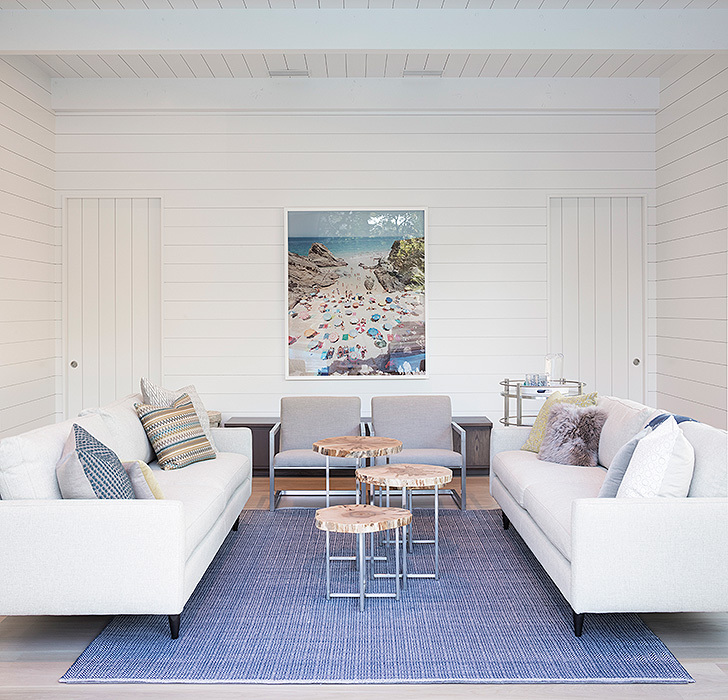 The large windows let us see through to the backyard from the front yard.” Additionally, the space capitalizes on light finishes and a mix of textures to give it a warm, coastal vibe. “The bones of the house have a real handcrafted feel to them. Between the walls and the floating threads, you get a beachy quality that still has a Nordic feel.” Perfect balance, eh? Nate worked with Design Associates at Room & Board Edina to find furnishings that complemented his unique home. “The dining table has a mid-century quality to it but the blonder materials speak to the lightness and airiness of the space,” he says. The view from the kitchen prep area. As for the living room, he wanted to make sure the furniture felt livable and comfortable. “You’ve got to think about comfort. Am I going to want to sit here for three hours or not?” Nate tells me how it’s easy to get caught up solely in design, but understanding you’re making a house a home means thinking about all the elements that make up a piece of furniture. Nate also tells me how Room & Board furniture makes it easy to create different moods within a space. While most of the home gives off those light, airy hues, he wanted to make a moody, modern statement inside the den for design juxtaposition. Here’s the den, just off the living room. 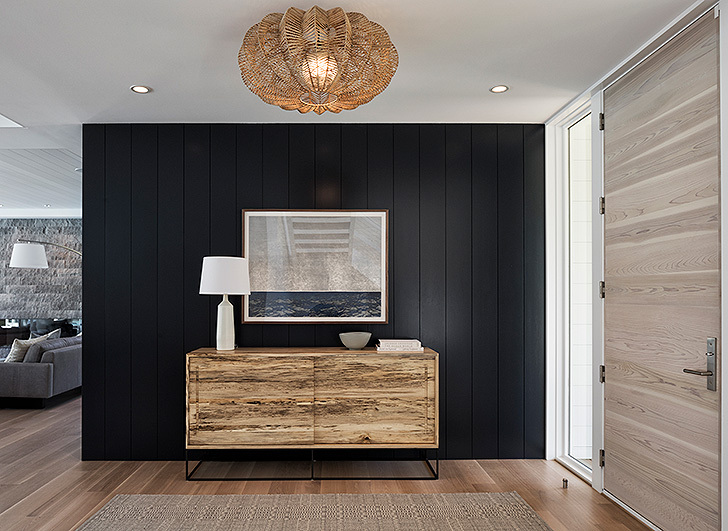 Navy shiplap wraps around the den and continues to make a statement in the entryway, alongside a bold storage piece and artwork. The spalted sugarberry Steen cabinet and water-inspired Ayomi Yoshia print playback to the nature-inspired vibes of California architecture, aiding the unique-yet-cohesive puzzle Nate referred to. 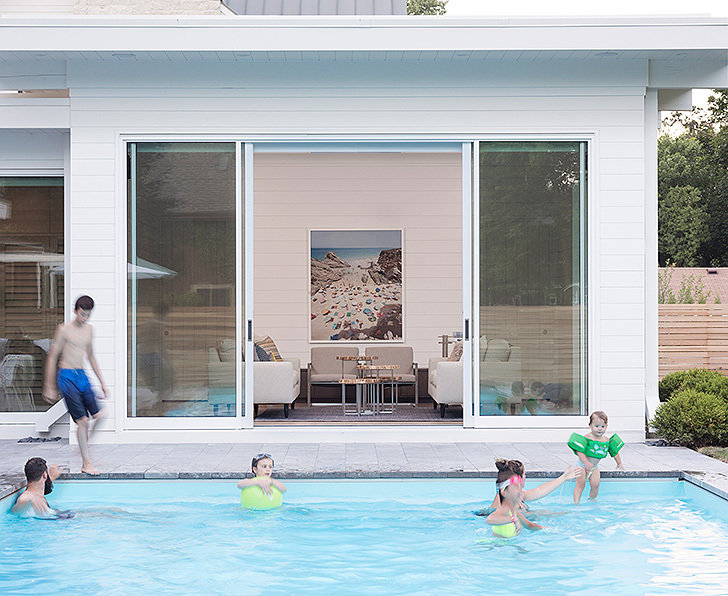 Take the family’s cabana, for instance. Right now, it’s a covered space that flanks the pool where kids can hang out, play cards, grab a shower after a swim. Longer term, it could be the perfect guest suite. Long-long term? One heck of a master suite. Much of the furniture in the cabana was chosen because of its durability. The Series rug is handwoven from polyester and resists stains and fading. Plus, it’s easy to clean and has a flexible backing that prevents the edges from curling. The Lira chairs are draped in Sunbrella® fabric, one of our best fabrics for family-friendly furniture. 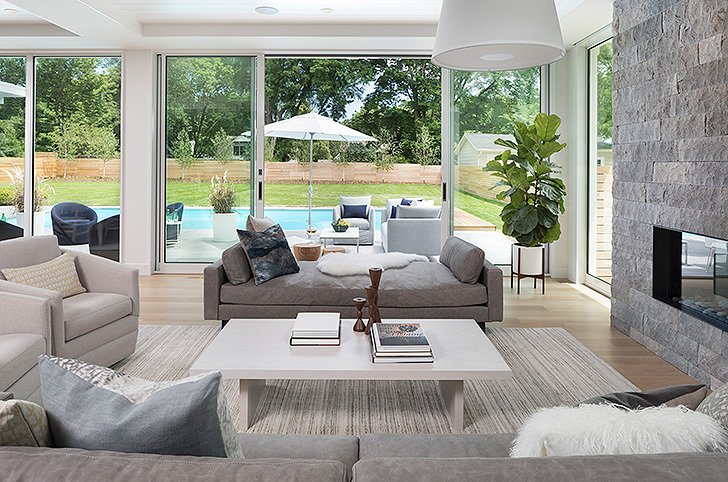 A sprawling back patio connects every part of the main level to the outdoors, paying homage to outdoor living (when the weather allows). The best part? All of our outdoor furniture can withstand anything the weather throws at it. Yep, even Minnesota winters. Where can I find the flush mount wicker light fixture in the entry way? The home is beautiful! Thank you! Wow…just wow! This home is beautiful, warm and modern. I love the mixture of light and dark finishes sjown in the floors and the walls. 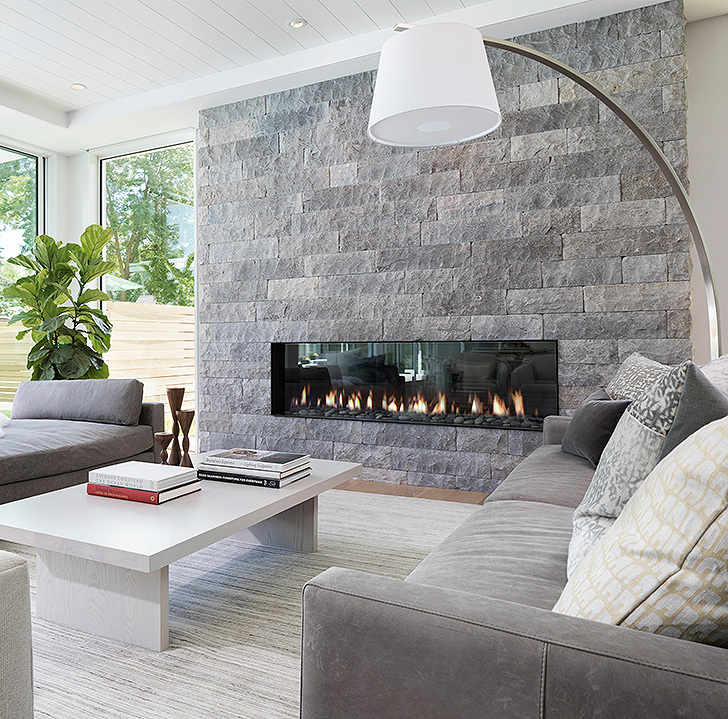 This is a clean, modern space that exudes comfort for family living. What brand and color is the wood floor? 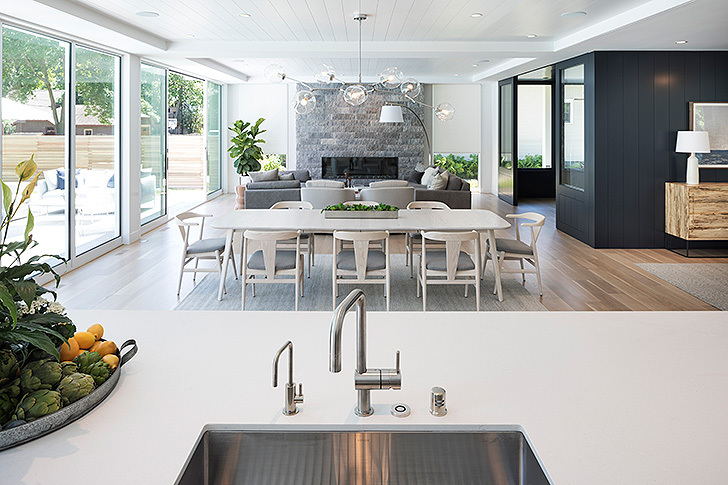 The entire home is gorgeous and I like the attention to function as well as style. The flooring is a 7” wide engineered White Oak hardwood. 75% of it is rift and quartered White Oak and 25% plain sawn White Oak. 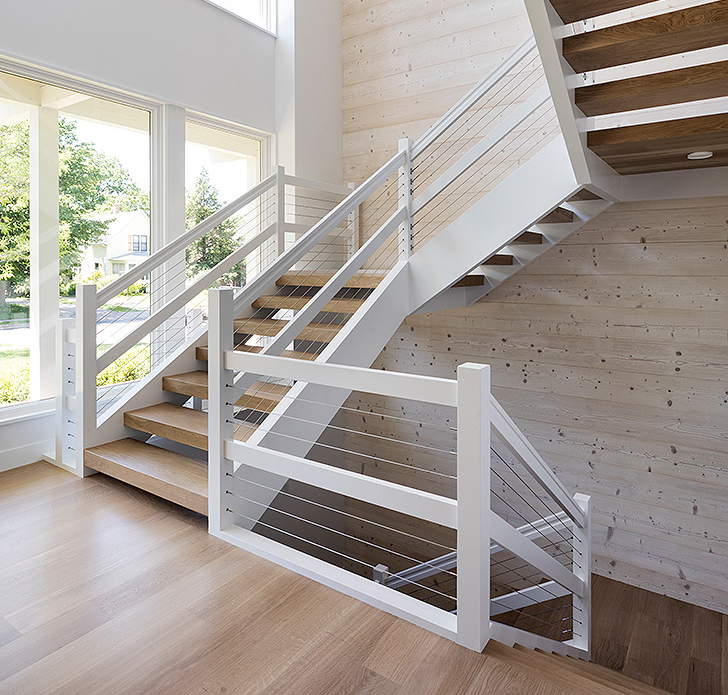 The product was sourced through the installer, Belrose Hardwood Floors. Hi. Beautiful home. R&B is fantastic. Where can i find the dining room chandelier? The chandelier isn’t ours, but our Humboldt chandelier has a similar look. We looked into where this chandelier is from and the owner got it at Muska lighting. We hope that helps! This house looks pretty bland and will “white out” during winter when trees and ground aren’t green or covered with snow. It would be interesting to see winter pictures too. What kind of windows? What type of insulation? Typical heating bill. Does the house feel cold in the winter? 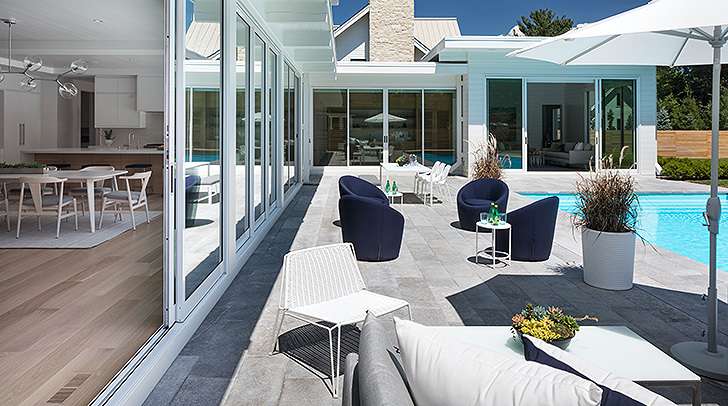 These are Marvin Windows and Arcadia sliding door systems. According to the owner, the home is well insulated and does not feel cold in the winter.